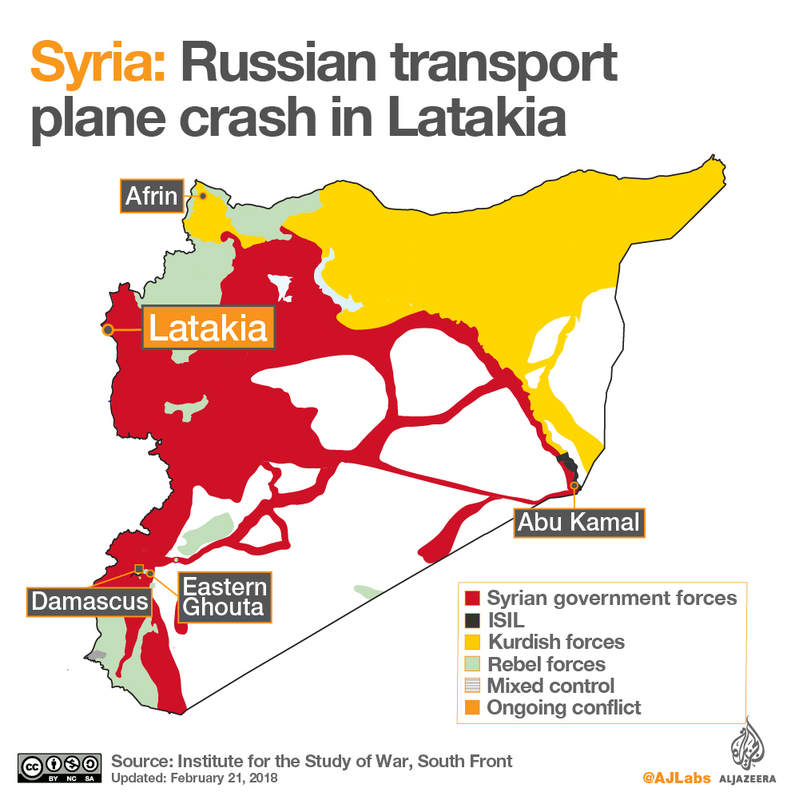 Plane went down at Russia’s Khmeimim airbase in Latakia province, killing 33 passengers and six crew. A Russian transport plane crashed in Syria killing all 39 people on board with the defence ministry saying the aircraft reportedly wasn’t shot down. The Antonov-26 aircraft crashed at Russia’s Khmeimim airbase in Latakia province on Tuesday, Russian media quoted the ministry as saying. Initial information suggested the crash may have been caused by a technical fault. The aircraft hit the ground about 500 metres short of the runway, the ministry said. Thirty-three passengers and six crew members were on the aircraft when it went down at about 3pm Moscow time (12:00GMT). All of the people aboard were Russian military personnel. The Khmeimim airbase is the main site for Russia’s military campaign in Syria. The plane reportedly did not come under fire. Russia’s Investigative Committee said on Tuesday it opened a criminal case into the crash. Investigators will look into suggestions that flight safety rules had been flouted. It was the second Russian military plane to crash in Syria this year, after a Su-25 ground attack jet was struck by a portable air defence missile over northern Idlib province last month. The pilot ejected and died down on the ground. Russia’s air force has played a crucial role in the seven-year war after it began operations in September 2015 in support of President Bashar al-Assad‘s government. Russia’s air power turned the tide in the war in Assad’s favour. Russian President Vladimir Putin ordered “a significant part” of Moscow’s military contingent at Khmeimim to start withdrawing in December, declaring their work largely done. But casualties continue to mount. Russian news agencies quoted the defence ministry as saying the incident sharply raises the death toll from the Kremlin’s Syria operation. Opinion polls indicate most Russians support the Syria intervention. But Dmitry Gudkov, a former member of parliament and a member of the anti-Putin opposition, said the Kremlin had questions to answer about the campaign. “How does the drawdown of forces look now? For the sake of what are these people dying? When will this senseless war end?” Gudkov said in a social media post.